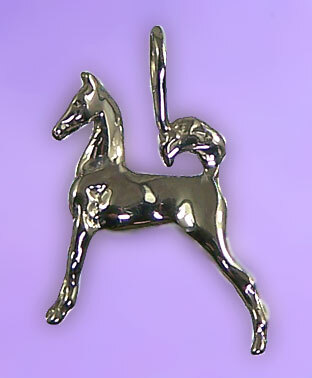 Sterling Silver Saddlebred pendant. Ideal for a necklace, lapel pin, tie tack, or a charm bracelet. Great for the Saddlebred horse lover. This is cute! A parked out filly ready for show. Offering three dimensional design, quality show style, and the look of a real Saddlebred filly. Available in 14kt yellow gold, 14kt white gold, sterling silver. Need a chain let us know!